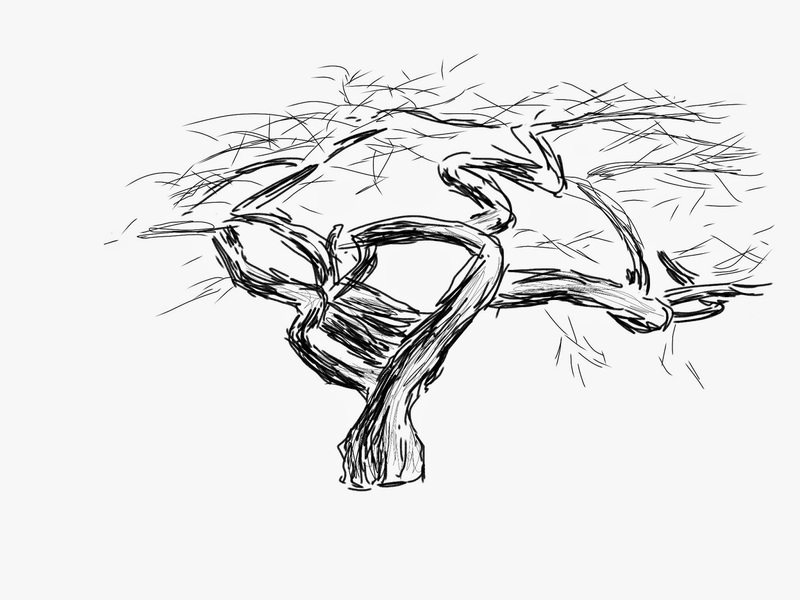 I brought my new tablet, using ArtFlow (as Autodesk Sketchbook won't work on a Nexus 9). A cherry tree, I think. But not even close to blooming. Back aways is a long line of mausoleum buildings. As I was heading back to the entrance I stumbled across a Japanese cemetery tucked away in a corner. Small, with the gravestones standing shoulder to shoulder. Except for a single free-standing memorial in the very center, dedicated to those killed in action in World War II. 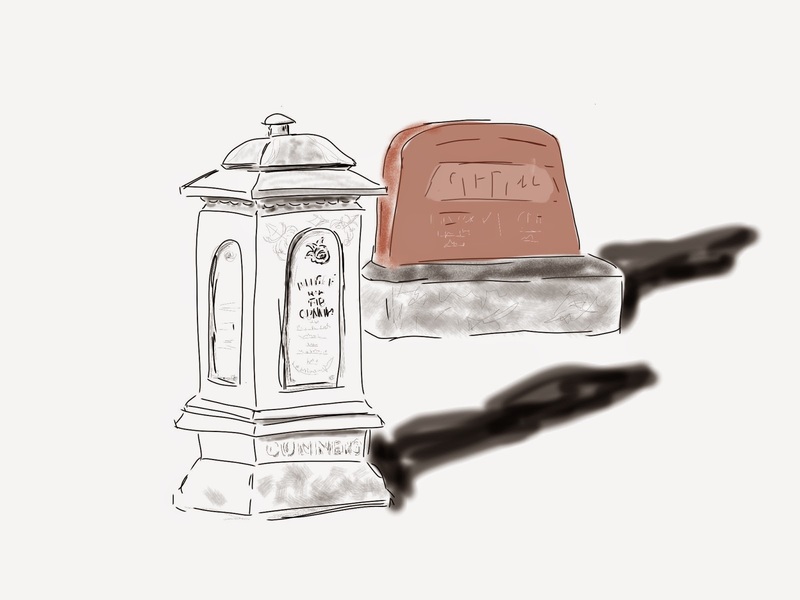 As I wandered through the cemetery with my fellow urban sketchers, I was drawn to this lovely grave marker. I settled myself down onto the grass and began to imagine the sunshine streaming through a kitchen window onto a happy family scene from long ago. This loving memorial was to someone precious to that family. Today we had another amazing turnout in the Beaumont neighborhood. A big hearty welcome to all of you new people! Let's not leave anybody out though - lots of love to everyone in the group, newcomers, regulars, and returning faces. I managed to draw one thing today in a brand new sketchbook. I learned a few things about my markers. Like, it's better to start with the light colors. 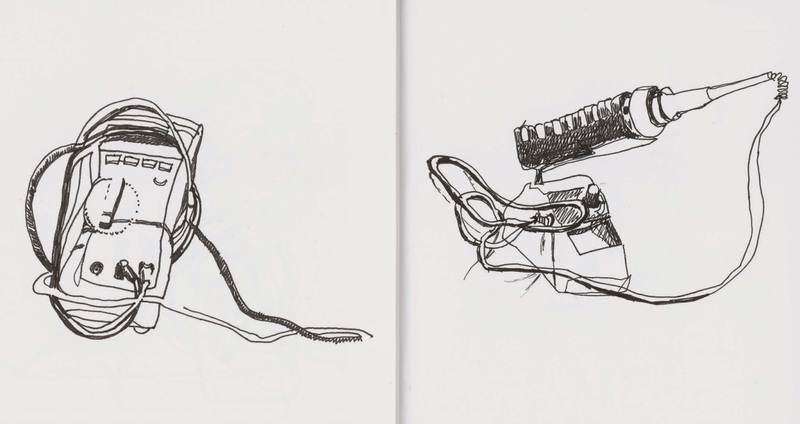 In the past month or so, I've gone to the Fields park a few times with some other sketchers. I mostly sketched from inside Ovation. 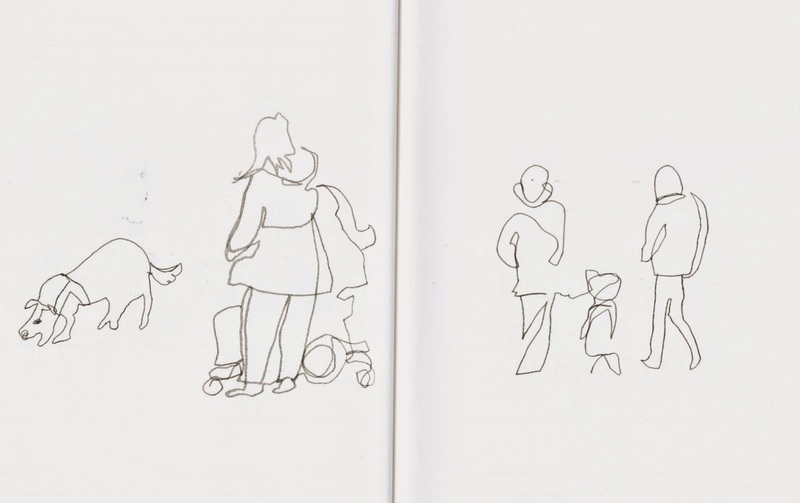 Lots of people, quick sketching, trying to fill up the sketchbook. A few weeks ago, I went with Drink and Draw to ^H, a new hacker space at 7600 N. Interstate. After drawing some people, I started drawing the fun geeky stuff they have there. Mission accomplished - that sketchbook is full! 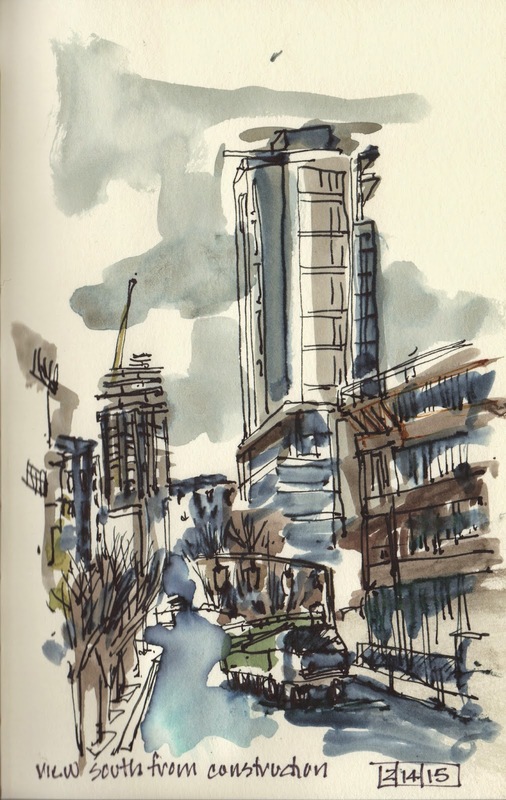 A lovely sketchcrawl on a sunny February day! 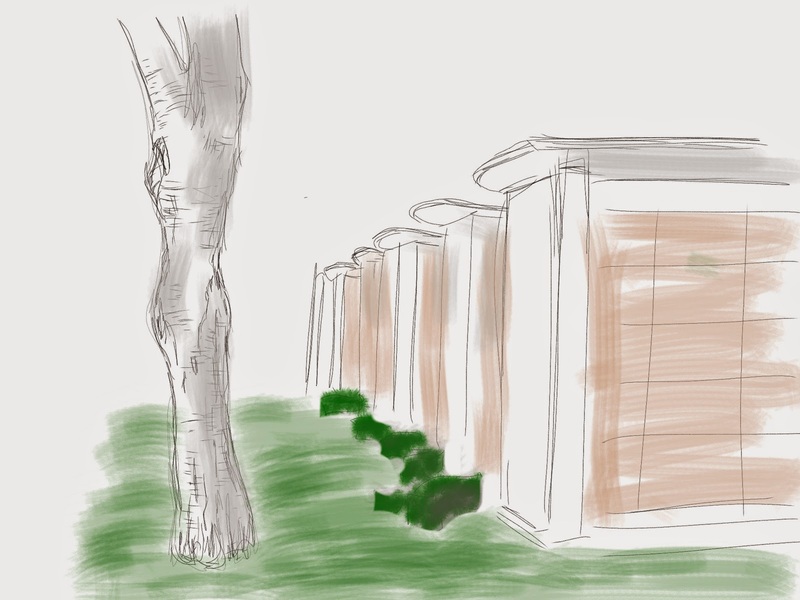 I strolled down to the Rose City Cemetery with a small team of sketching pals and we settled into the lovely, peaceful green space to sketch. My toddler was very keen on having me help her with the walking practice on the lawn, so I only got off a few quick impressions of the meticulously-sculpted holly trees that lined the entry drive. And borrowed oil pastels for a splash of color appropriate to the sunny day! My tiny helper was so kind as to color in the blue on the lower part of the page. We then had to act fast to keep her from coloring on any of the headstones, but she did at least add some oil pastel bling to her shoes to top off the adventure. 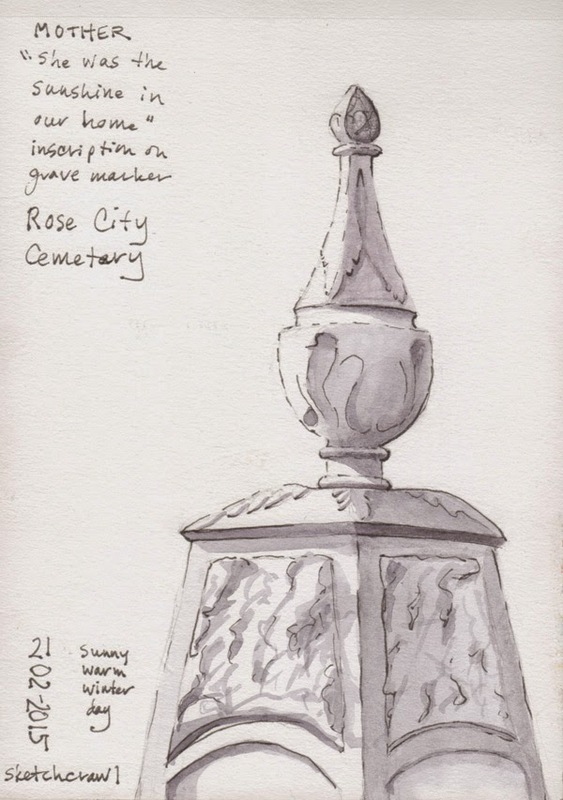 Big thanks to the friendly staff of the Rose City Cemetery who made us feel very at home (and who are eager to see what other people drew via the blog posts.) The urgency of naptime kept us from attending the sketchbook sharing at lunch, so I'm eager to see folks post what they drew around the neighborhood as well! 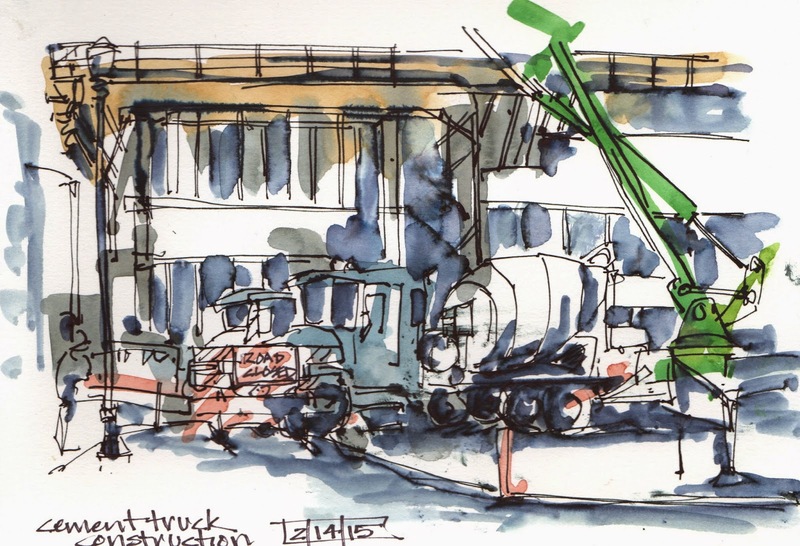 Thought I'd post these to go along with the other sketcher postings of our day among the giants...ie cememnt trucks and pumpers amid the construction at the Fields. sketch with multi colored pencil...what fun! This first was to get my head around the active scene...as soon as one cement truck was emptied of its load it left and a new truck moved into place. A ballet of movement across my stage. This last view is of the street after all of the trucks have left and this last pumper truck is set to go too. 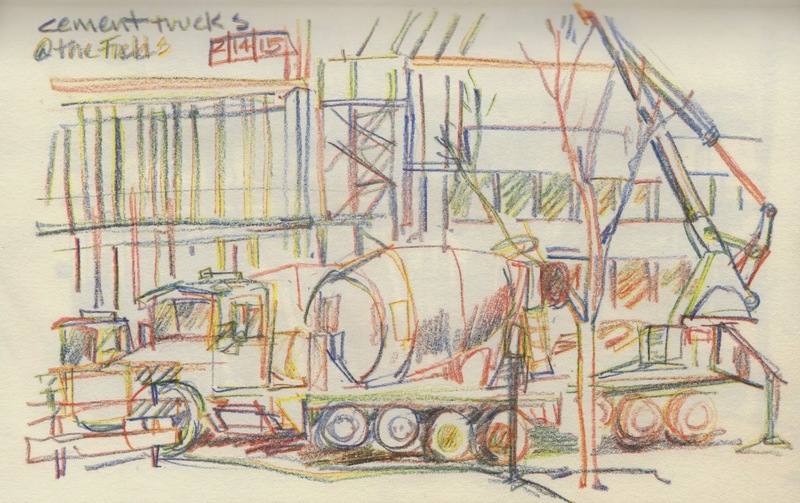 The cement trucks were lined up ready to move into place when the last one emptied its load. I didn't have to worry about losing that perfect moment to sketch something because it was the same scene over and over. I've been thinking about Fibonacci spirals and golden proportions lately, and I imagined that the arch of the long arms pumping the concrete into place was roughly creating the famous shape, and some of the buildings proportions and relationship to one another seemed to fit too. It was beautiful weather for sketching, and the great company of fellow sketchers added immensely to the delight of the day! There was so much going on near the Fields today, it was like Busytown. 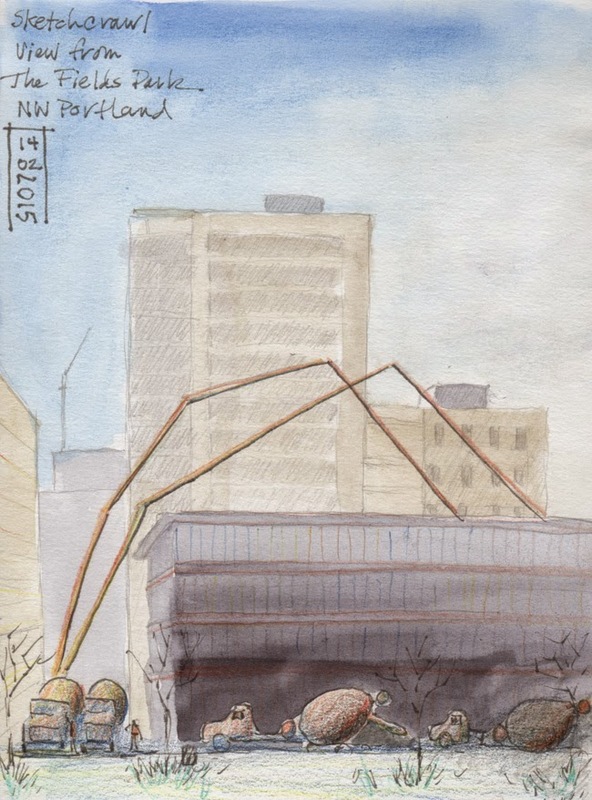 For this sketch, I sat in the courtyard of an apartment building and drew the praying mantis like arms of the cement pump trucks, a crane, a photo shoot, and the shadows and peeling bark of the River Birch trees (thank you, Deb). With all of this, I still didn't get in one of the dozens of cement trucks that were there for a big pour. 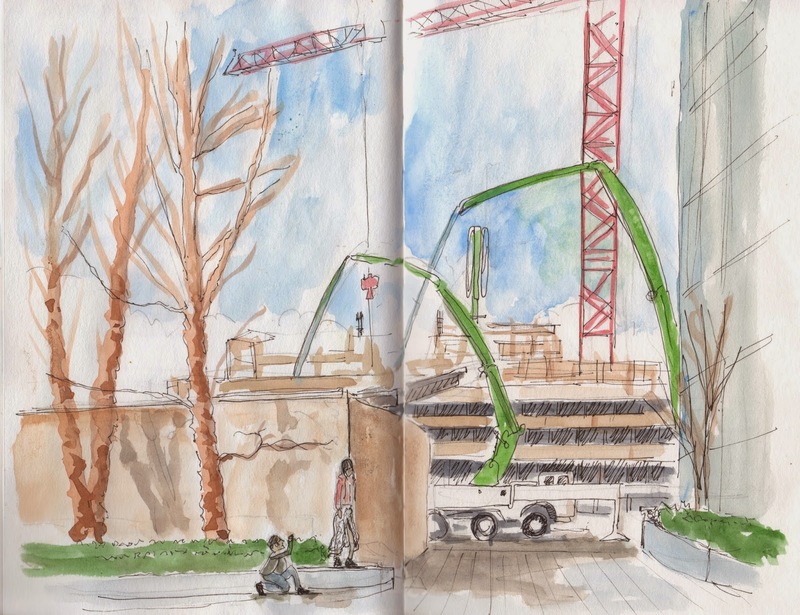 With the background sound of huge machines, there were still lots of people out enjoying the sun, including a small group of happy sketchers. 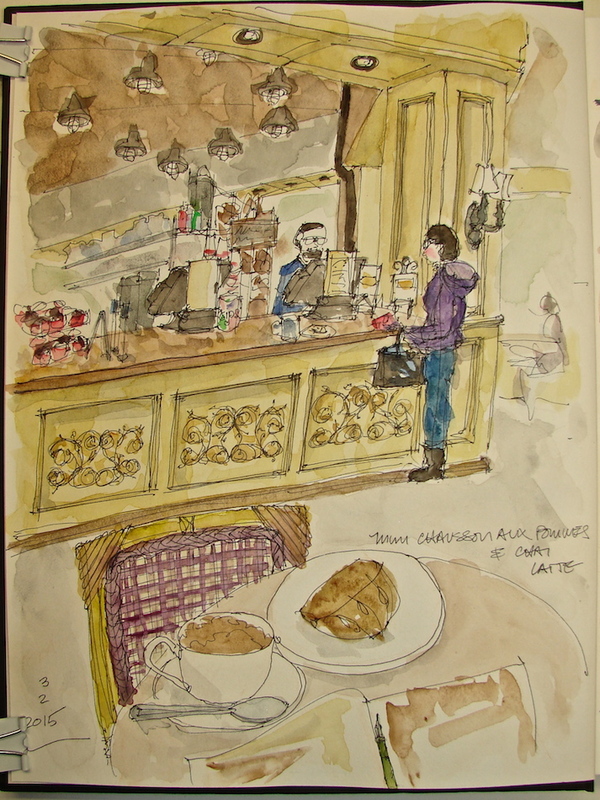 Many thanks to Deb for organizing a sketch gathering today! 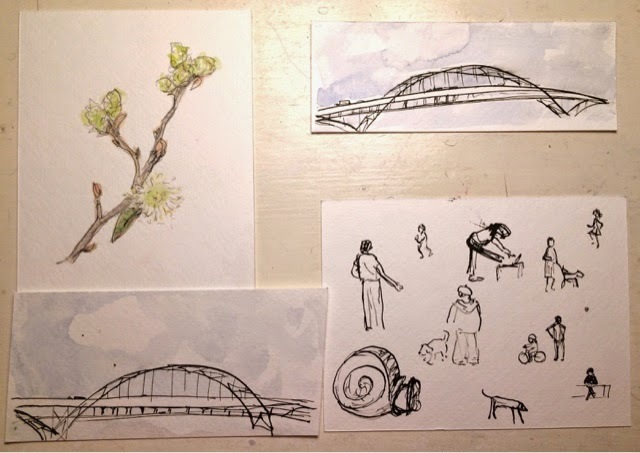 I didn't want the sun in my eyes, so I worked on the Fremont bridge and lots of quick sketches of the people and pets enjoying the grassy field. Plus one more little plant sketch, because this is what always catches my eye. I decided to risk it and sketch with a nib and an inkwell, but it took forever to dry, and the worry of spilling was pretty distracting, so it may be a while before I try it again. There were lots of great views of construction, so I'll have to go back again. 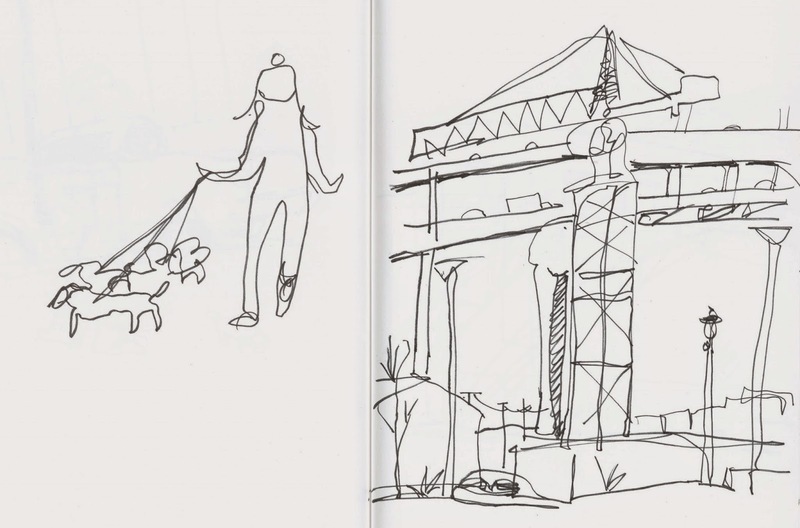 In the meantime, I'm looking forward to sketching with all of you in a week in the Beaumont neighborhood! Nick’s Italian Cafe was elegant, simple, feeling a bit NYC-ish. Their design statement is the undulating wall of cut barrels running the length of the restaurant, and simple white tablecloths with a single red rose on each tabletop. Mitchell and I had an amazing meal, a pear/Gorgonzola/caramelized onion thin crust pizza and a Caesar’s salad. And then oh my, the most amazing cheeseburger ever! Beef ground in-house, and the meat perfectly prepared. Heaven! The reason you eat beef is the flavor should be as good as anything you top it with. No salt + pepper on the table which I often find pretentious but not here. Thin sliced onions, tomato, lettuce and goop all added up to perfection. I sketched while eating and came back to the studio to paint. I have to go back to sketch the interior and modern exterior. Strathmore Mixed Media journal with Pentalic graphite pencil, various pens including the Platinum Carbon Pen + ink, and with De Artramentis Document ink (black), and Daniel Smith watercolors. I stopped for a morning latte last week at Nuvrei in the Pearl. golden stacks of all types of bagels. Since I am taking Marc Taro's online class I decided to add the fellow making sandwiches behind the counter. 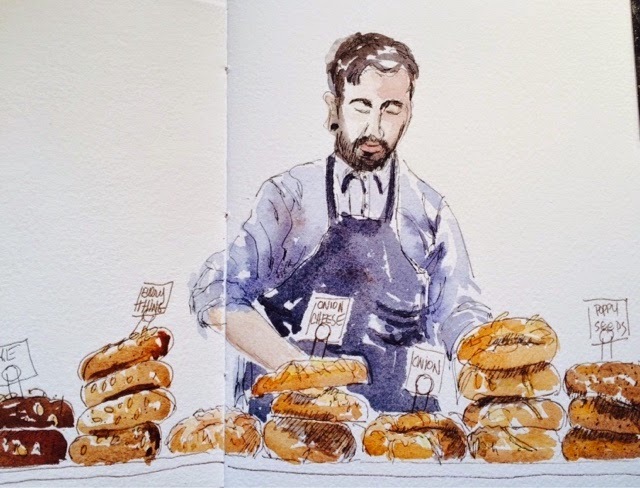 Luckily the bagels hid his hands so I didn't have to draw those. 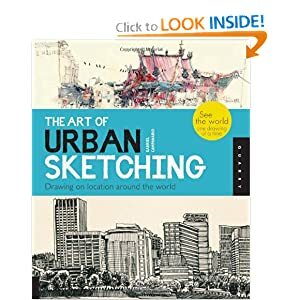 For anyone intimidated by drawing figures I highly recommend his online class. I am so much more comfortable with objects, not people! 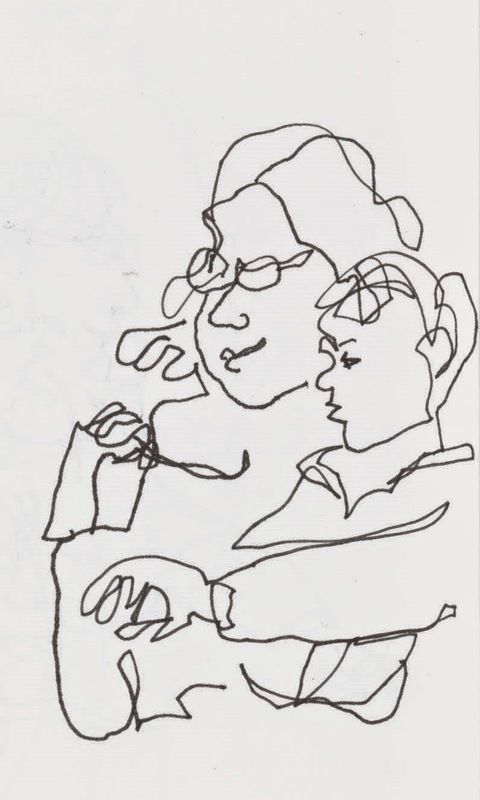 But pushed to include a couple in this sketch as I am working on it with Marc Holmes class. I spent 90 minutes at St. Honoré Boulangerie. I took the time to setup, studying the overhead lighting to see how it aligned with the front counter and how the odd angles aligned with the counters. This assisted in showing me I needed to flatten the lighting in back a bit and saved my proportions overall. Later I used the set-up to test mixed watercolors. The waitress took an inordinate amount of cleaning (several times) at the condiment stand next to me and finally admitted she was making excuses to watch me and could she simply look over my shoulder. No problem with that for me. 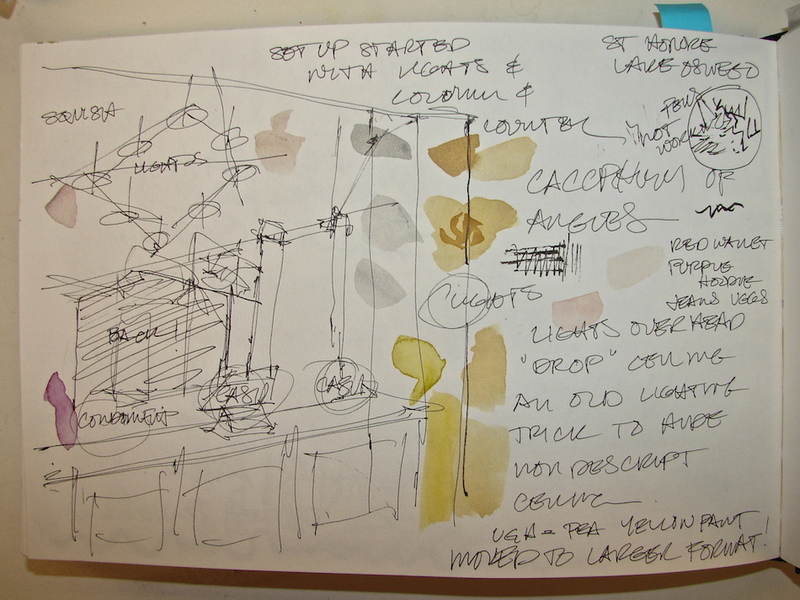 The set-up also allowed me to take some notes on colors so I could add color in my studio -- and I took images with my old phone but have NO idea how to remove them. Hardly worth it; I have an exacting eye for color. The paint is the color of yellow split peas. I wrapped up about the time Mitchell was to pick me up. I decided to move to the bar and sketch the big oven. No set-up -- no time! Finished the rough sketch in about 15 minutes (color added in studio.) They were just starting to fill the coffee eclairs in front of me when Mitchell called! Yeow! I added my meal. I really do not like white plates! Boring! Drawn in an Strathmore Mixed Media journal with a Platinum Carbon pen, a Sailor Pen (new pens, getting used to), with De Artramentis Document ink (black), and Daniel Smith / QoR watercolors. 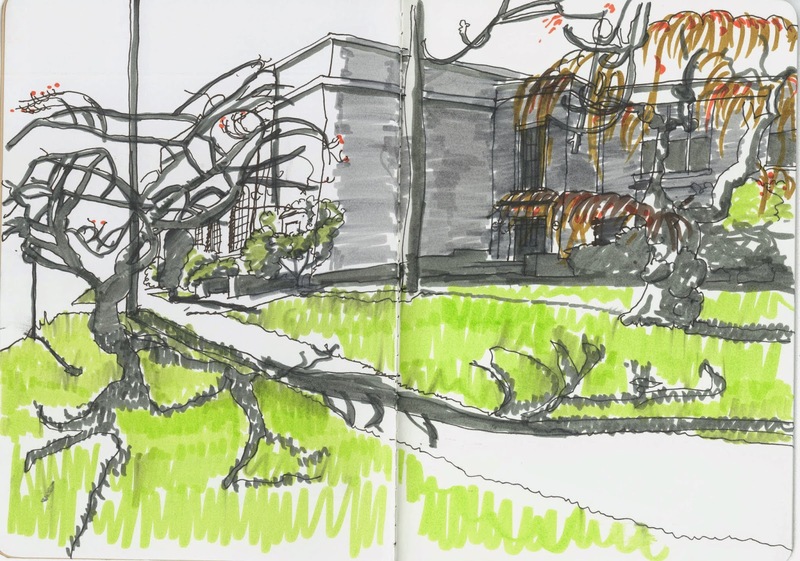 February Sketchcrawl: Beaumont Neighborhood at NE Fremont and NE 40's. Let's check out NE Portland! This particular spot is close to Beaumont Middle School, a cemetery, some shopping, and some coffee shops and restaurants. 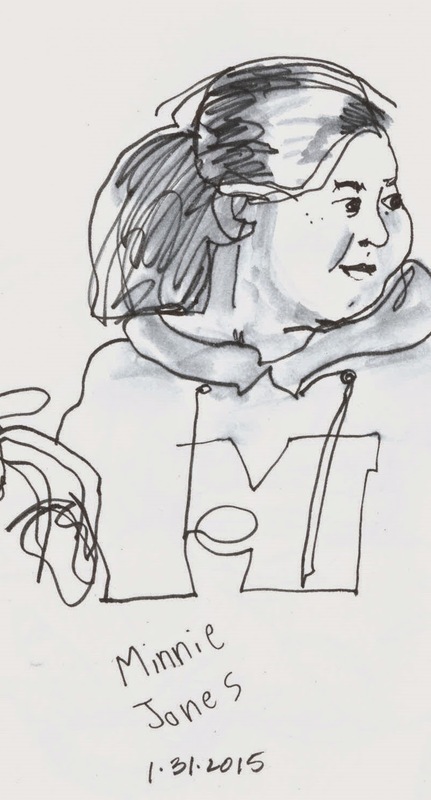 10:00 am: Meet at Grand Central Bakery - Beaumont - for coffee/breakfast/snacks: 4440 NE Fremont St.
10:30 am: Sketch the neighborhood. 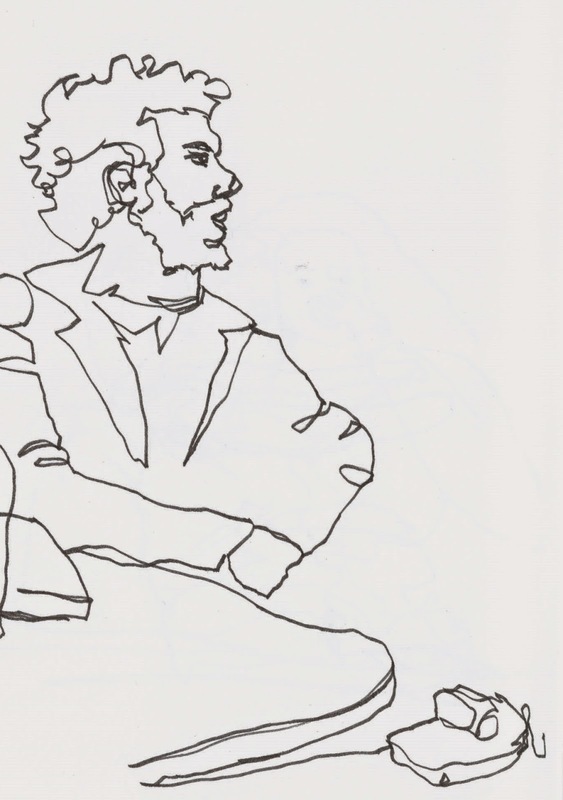 12:00 noon: Optional sketchbook sharing and lunch Alameda Cafe 4641 NE Fremont St. I haven’t had much time to paint anything this week but found moments in the car. an architectural rendering of Arco Towers Long Beach. I could do these in my sleep. Moving from highly structured to free-wheeling is difficult!It is especially difficult when my brain is translating the scene as a thing that should be drawn structured! Annoyed, I finally decided to try layering the cacophony all at once without thought to shapes to see how that would work, and gave myself 15 minutes. No what’s in front and what’s in back; no set-up and figuring. Just draw a giant gesture of the crazy jumble of lines. I started with the gentle arch of the bridge and then the tall arches, then moved to anchor each side of the page. It totally worked to loosen me up and relax me. 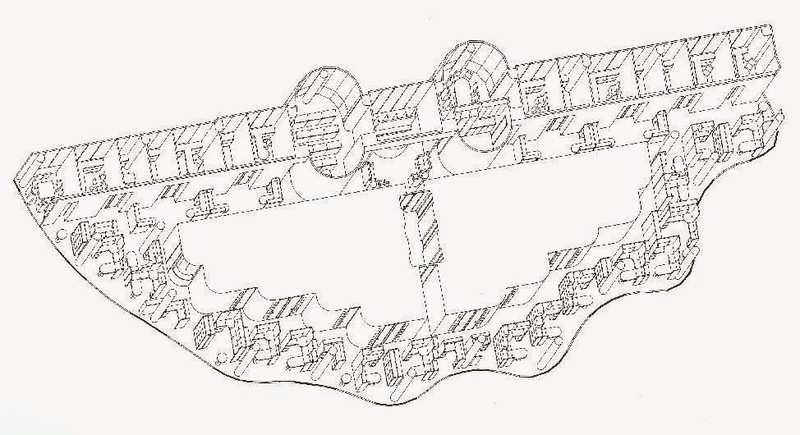 Getting even one of these complicated scenes down was a coup. I think I am on to something. Got me over the hump, anyhow.